Carter has demonstrated over a long period how much he believes deeply in the principles of caring for the environment, for animals, for his community, for food safety and much more. As Carter likes to say – he doesn’t go to the beach or the mountains or take many vacations, because there is no place he’d rather be than at his farm, caring for his animals and his farm. Carter has been a pioneer in researching and adopting new and emerging technologies. He allowed a full-scale demonstration project on his farm. He has adopted other newer technologies, as well. And he has an outstanding compliance record with the Department of Environmental Quality. Carter has owned and operated a finishing operation in Beulaville since 1985. He’s had business partnerships with Carroll’s, Dogwood and, most recently, Smithfield. In addition to his hog operation, Carter owns approximately 60 brood cows and is an active member of the Duplin County Cattleman’s Association. Carter has been a member of the Beulaville Fire Department since 1977 and has served as its Fire Chief for almost 30 years. This past year, he was involved in coordination of multiple water rescues during the hurricane, literally helping to save lives. Carter started a law enforcement career in 1982 as a part-time deputy for the Duplin County Sheriff’s Office and as a part-time police officer for the Beulaville Police Department. In 1987, he became a full-time police officer with the Beulaville Police Department and served the citizens of Beulaville until his retirement in 2014. Carter doesn’t have to say he cares for his community. He shows it. It’s a principle he lives out every day by helping neighbors in need, lending a hand or equipment to those who need help. Joey Carter has stood up as a great example to our entire state of how to be a positive, hopeful, and committed pork producer in North Carolina. 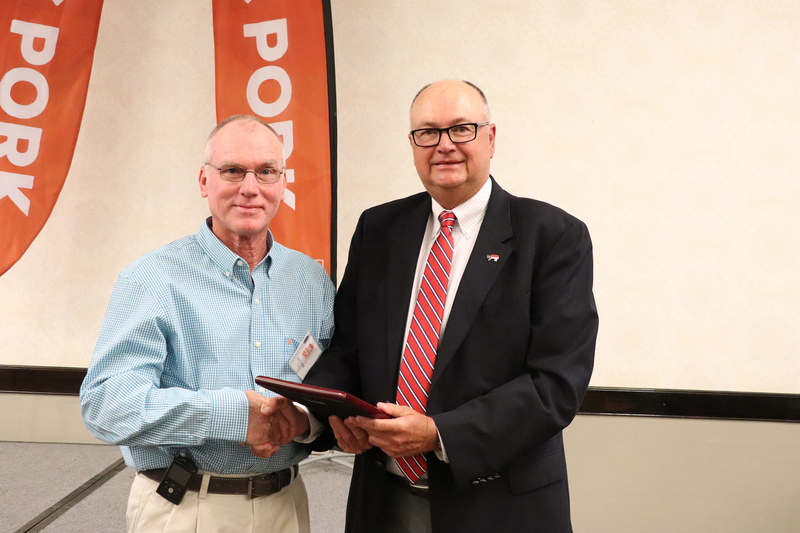 We are proud to recognize Joey Carter as the Outstanding Pork Producer of the Year.